The design, published in Nature Photonics, adapts technology used in fusion research. Several locations could now enter a race to convert photons into positrons and electrons for the very first time. This would prove an 80-year-old theory by Breit and Wheeler, who themselves thought physical proof was impossible. Now, according to researchers from Imperial College London, that proof is within reach. Prof Steven Rose and his PhD student, Oliver Pike, told the BBC it could happen within a year. “With a good experimental team, it should be quite doable,” said Mr Pike. If the experiment comes to fruition, it will be the final piece in a puzzle that began in 1905, when Einstein accounted for the photoelectric effect with his model of light as a particle. Several other basic interactions between matter and light have been described and subsequently proved by experiment, including Dirac’s 1930 proposal that an electron and its antimatter counterpart, a positron, could be annihilated upon collision to produce two photons. Breit and Wheeler’s theoretical prediction of the reverse – that two photons could crash together and produce matter (a positron and an electron) – has been difficult to observe. “The reason this is very hard to see in the lab is that you need to throw an awful lot of photons together – because the probability of any two of them interconverting is very low,” Prof Rose explained. His team proposes gathering that vast number of very high-energy photons by firing an intense beam of gamma-rays into a further cloud of photons, created within a tiny, gold-lined cylinder. That cylinder is called a “hohlraum”, German for “hollow space”, because it contains a vacuum, and it is usually used in nuclear fusion research. The cloud of photons inside it is made from extraordinarily intense X-rays and is about as hot as the Sun. Hitting this very dense cloud of photons with the powerful gamma-ray beam raises the probability of collisions that will make matter – and history. “It’s pretty amazing really,” said Mr Pike. He says it took some time to realise the value of the scheme, which he and two colleagues initially jotted down on scrap paper over several cups of coffee. But their subsequent calculations showed that the design, theoretically at least, has more than enough power to crack the challenge set by Breit and Wheeler in the 1930s. “All the ingredients are there,” agrees Sir Peter Knight, an emeritus professor at Imperial College who was not involved in the research but describes it as a “really clever idea”. “I think people will seriously start to have a crack at this,” Prof Knight told BBC News, though he cautioned that there were a lot of things to get right when putting the design into practice. Some healthy scientific competition may speed up the process. There are at least three facilities with the necessary equipment to test out the new proposal, including the Atomic Weapons Establishment in Oldham. “The race to carry out and complete the experiment is on,” said Mr Pike. Dancers traditionally use a technique called “spotting”, which minimises head movement. They use a technique called spotting, focusing on a spot – as they spin, their head should be the last bit to move and the first to come back. Magnetic resonance imaging (MRI) scans were also taken to look at participants’ brain structures. Dancers’ perception of spinning lasted a shorter time than rowers’ – and the more experienced the dancers, the greater the effect. Dr Barry Seemungal, of the department of medicine at Imperial College London, who led the research, said: “It’s not useful for a ballet dancer to feel dizzy or off balance. Their brains adapt over years of training to suppress that input. Surprisingly, the quartz doesn’t even have time to crystallize, the study indicates. Instead, the mineral comes out of the fluid in the form of nanoparticles, perhaps even making a gel-like substance on the fracture walls. The quartz nanoparticles then crystallize over time. Enceladus is little bigger than a lump of rock and has appeared, until recently, as a mere pinprick of light in astronomers’ telescopes. Yet Saturn‘s tiny moon has suddenly become a major attraction for scientists. Many now believe it offers the best hope we have of discovering life on another world inside our solar system. 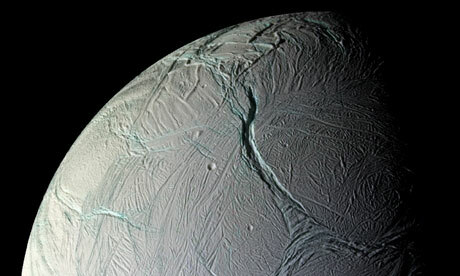 At the moon’s south pole, Enceladus’s underground ocean appears to rise close to the surface. At a few sites, cracks have developed and water is bubbling to the surface before being vented into space, along with complex organic chemicals that also appear to have built up in its sea. “Those plumes do not represent a torrent,” cautions McKay. “This is not the Mississippi pouring into space. The output is roughly equivalent to that of the Old Faithful geyser in Yellowstone national park. On the other hand, it would be enough to create a river that you could kayak down. Such a mission would therefore involve almost 20 years of space flight – on top of the decade needed to plan it and to construct and launch the probe. “That’s 30 years in all, a large chunk of any scientist’s professional life,” says McKay. McKay and a group of other Nasa scientists based at the Jet Propulsion Laboratory in Pasadena are undaunted, however. They are now finalising plans for an Enceladus Sample Return mission, which would involve putting a probe in orbit round Saturn. It would then use the gravity of the planet’s biggest moon, Titan, to make sweeps over Enceladus. Plume samples would then be stored in a canister that would eventually be fired back to Earth on a seven-year return journey. Crucially, McKay and his colleagues believe such a mission could be carried out at a relatively modest cost – as part of Nasa’s Discovery programme, which funds low-budget missions to explore the solar system. Previous probes have included Lunar Prospector, which studied the moon’s geology; Stardust, which returned a sample of material scooped from a comet’s tail; and Mars Pathfinder, which deployed a tiny motorised robot vehicle on the Red Planet in 1997. Many scientists argue that water could exist deep below the Martian surface, supporting bacteria-like lifeforms. However, these reservoirs could be many metres, if not kilometres, below Mars’s surface and it could take decades to find them. Similarly, the oceans under the thick ice that covers Europa – and two other moons of Jupiter, Ganymede and Callisto – could also support life. But again, it will be extremely difficult for a robot probe to drill through the kilometres of ice that cover the oceans of these worlds. Enceladus, by these standards, is an easy destination – but a distant one that will take a long time to reach. “No matter where we look, it appears it will take two or three decades to get answers to our questions about the existence of life on other worlds in the solar system,” says Cockell. “By that time, telescopes may have spotted signs of life on planets elsewhere in the galaxy. Our studies of extra-solar planets are getting more sophisticated, after all, and one day we may spot the presence of oxygen and water in our spectrographic studies of these distant worlds – an unambiguous indication that living entities exist there. However, telescopic studies of extra-solar planets won’t reveal the nature of those lifeforms. Only by taking samples from planets in our solar system and returning them to laboratories on Earth, where we can study them, will we be able to reveal their exact nature and mode of replication – if they exist, of course. The little world of Enceladus could then have a lot to teach us.